Although Spijkstaal produced 4-wheelers from 1930 in Holland, it was not unit 1955 that they produced a 3-wheeler. Their first 3-wheeler was a milk float powered by an electric motor that drove the single front wheel. 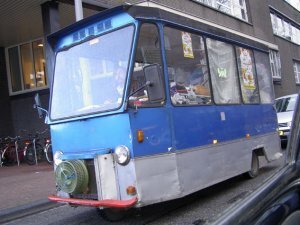 With a top speed of 10mph (16 kph) the vehicle was built in many other forms, especially during the 1970’s when it was also popular as mobile shops, garbage trucks and also used by Netherlands Railways for transporting mail and goods. To date the company have continued to produce both 3 and 4-wheelers though a majority of the 3-wheelers are electric tractors with single seats to be used as work horses. Powered by a 48 volt - 8.7 kW motor the various vehicles have a towing capacity of between 2 - 10 tons and a top speed of around 10 - 18 kph.